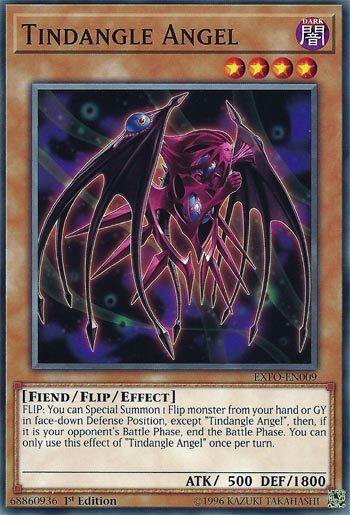 FLIP: You can Special Summon 1 Flip monster from your hand or GY in face-down Defense Position, except “Tindangle Angel”, then if it is your opponent’s Battle Phase, end the Battle Phase. You can only use this effect of “Tindangle Angel” once per turn. Tindangle Angel is a Level 4 Dark Fiend-type Flip Monster with 500 Atk and 1800 Def. Flip Monsters can certainly utilize the Def, and this monster is all about defense. When it’s flipped you can Special Summon a different Flip Monster from your hand or grave in face-down Def position. Having the versatility makes the effect useful in any part of the game. Furthermore, if it was flipped during your opponent’s Battle Phase, you get the Special Summon and the ending of the Battle Phase. Obviously Tindangle Angel is very useful in Tindangle decks, but might also be useful in that Subterror Deck or Shaddolls. Versatility is good, but offense would be better. Still a solid card. Score: 3/5 Art: 4/5 Creepy. I don’t know much about the Tindangle archetype, but I feel I can fairly review some of their cards, and this is a great example, Tindangle Angel. Angel is a Level 4 Dark Fiend with 500 ATK and 1800 DEF. ATK is poor but DEF is solid, Level is good, type goes very well with the attribute. Angel is a Flip effect monster that only Special Summons a Flip monster from the hand or GY in face-down Defense Position when flipped face-up excluding another copy of itself, and this is a hard once per turn. Solid effect for any Flip deck to have, you want to be able to get your Flip monsters on the field in face-down defense, and some you would love to reuse. I feel Angel can be a good card in many Flip decks, and worth considering teching it in. Since Tindangles are a Flip deck, you should most likely be playing this in that deck. Solid card for Flip decks in general. Also, if it is the opponents battle phase when this effect goes off, end the battle phase. A nice little bonus to an already good effect, more of an incentive to play this in Flip decks. Isn’t it fun when a card with Angel in its name can look like this and be a Dark, Fiend type Monster? This is a great Flip card, and trust me, there are plenty of people who love playing a good Flip Deck. The attack is poor (500) but the defense is good (1800) and Level 4 is a good thing too (as are the prior mentioned Dark/Fiend pairing). When this card is Flip Summoned, you can set a Flip Monster face down on the Field in Defense position, and the card can come from your Hand or Graveyard. Versatility is nice, as coming from the Hand, it’s a surprise (or should be) while coming from the Graveyard, your opponent is going to know what it is prior. This card has the bonus ability also of ending the opponent’s Battle Phase if this effect is activated during that segment of their turn. A decent, solid enough card I feel. Previous articleTalk to Pikachu on Amazon Alexa and Google Home!